The Baggins bloodline is the product of a careful line-breeding program spanning more than 30 years. I carefully select only the very best dogs from each generation to continue in my show and breeding programs. My breeding program produces beautiful dogs known worldwide for their superb quality and distinctive look. While Baggins Shar-Pei has some of the finest examples of rare Shar-Pei colors in the world, I breed for quality first and color second. As a testament to the success of this approach, I have produced the first three lilac Shar-Pei champions. To my knowledge, they are the only lilac champions to date. Most people think that the more wrinkling a young puppy has, the more it will have as an adult. This is not necessarily true. Wrinkling is simply excess skin compared to body size. If a puppy puts on all it's excess skin by 6 to 8 weeks, it is usually going to grow into the skin. Puppies who tend to add extra skin slowly as they grow will usually have more adult wrinkling. Many of my puppies will get stockier and add wrinkles until they are about 18 months old. So while my puppies tend to be plainer at a younger age than others, they usually mature into very striking adults. The temperament of Shar-Pei from my bloodline is very important to me. I screen dogs very carefully before I consider keeping them in my breeding program. I absolutely will not allow any dog with aggressive tendencies to contribute to the Baggins bloodline. Over the years, this has resulted in consistently tame and family friendly dogs. Health is another attribute for which I screen very carefully. Like any breed, Shar-Pei have some genetic health issues that occur at higher rates than with other breeds. I am very familiar with identifying and treating all of these issues. 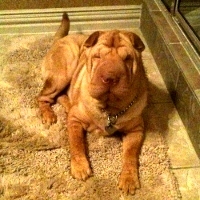 Animals with any of the serious Shar-Pei health issues do not make it into my breeding program. I have very good quality shar-pei, but no perfect ones. No one does. The average lifespan of Baggins Shar-Pei is about 10 years. I have many living older than this but I believe this is a fair average. Several owners contacted me recently to let me know their Baggins Shar-Pei are 14 and older and are still very active and healthy. I have only "meatmouth" Shar-Pei, as this is the only correct muzzle on a shar-pei. The Chinese Shar-Pei breed standard. describes the muzzle on a shar-pei as broad and well padded with no suggestion of snippiness.